Now find us on Facebook! The Israelites left Mount Hor by the road to the Sea of Suph, to skirt the land of Edom. On the way, the people lost patience. They spoke against God and against Moses, ‘Why did you bring us out of Egypt to die in this wilderness? For there is neither bread nor water here; we are sick of this unsatisfying food. At this God sent fiery serpents among the people; their bite brought death to many in Israel. The people came and said to Moses, ‘We have sinned by speaking against the Lord and against you. Intercede for us with the Lord to save us from these serpents.’ Moses interceded for the people, and the Lord answered him, ‘Make a fiery serpent and put it on a standard. 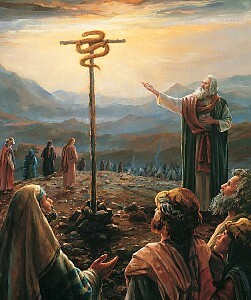 If anyone is bitten and looks at it, he shall live.’ So Moses fashioned a bronze serpent which he put on a standard, and if anyone was bitten by a serpent, he looked at the bronze serpent and lived. Jesus said to the Pharisees: ‘I am going away; you will look for me and you will die in your sin. Where I am going, you cannot come.’ The Jews said to one another, ‘Will he kill himself? Is that what he means by saying, “Where I am going, you cannot come”?’ Jesus went on: ‘You are from below; I am from above. You are of this world; I am not of this world. I have told you already: You will die in your sins. 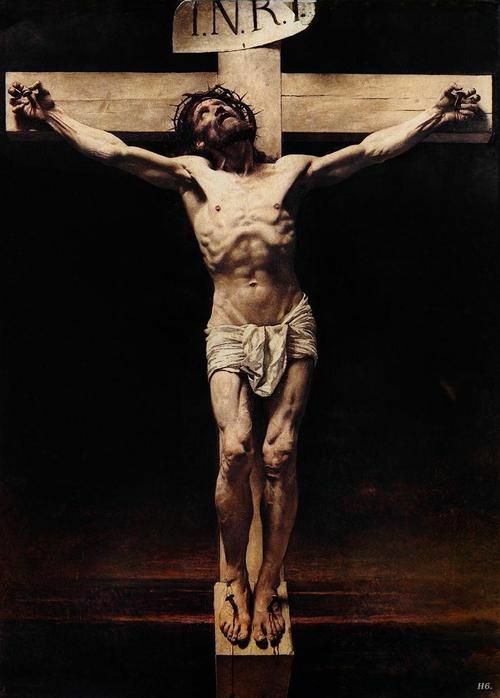 Yes, if you do not believe that I am He, you will die in your sins.’ So they said to him, ‘Who are you?’ Jesus answered: ‘What I have told you from the outset. About you I have much to say and much to condemn; but the one who sent me is truthful, and what I have learnt from him I declare to the world.’ They failed to understand that he was talking to them about the Father. So Jesus said: ‘When you have lifted up the Son of Man, then you will know that I am He and that I do nothing of myself: what the Father has taught me is what I preach; he who sent me is with me, and has not left me to myself, for I always do what pleases him.’ As he was saying this, many came to believe in him.